Every girl enjoys a little bling. With the price of diamonds sky rocketing consider rhinestones for your lady this Valentine’s day. Rhinestones are bright & sparkly and you can find wonderful brooches, rings, necklaces and bracelets in almost every price range. You can find a rhinestone perfect for anyone. There are rhinestones for the business women, for the young and the young at heart, for the bride , for the prom girl, for the sophisticated, for the mature women, and who could forget the famous Liberace? Rhinestones adorned his clothing, including shoes, his piano and even the vehicles he rode in! Rhinestones got their name from the Rhine River in Europe. In the 1800’s the river was filled with quartz pebbles in bright colors that were mined and used for jewelry making. Eventually, as the river became depleted imitation glass pebbles became their replacement. 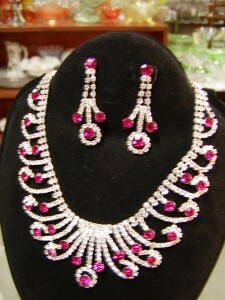 Rhinestones are made by taking highly refined glass and pressing it into a mold. The stone is then ground and polished until it shines. Foil backing is then added to increase the brilliance of the stone. Before the late 1800’s this was all done by hand. In the 1890’s, Austrian, Daniel Swarovski (a name you might recognize) created a new machine that could cut faceted glass in a timely manner. He also patented his process of permanently applying foil backing to high led content crystals to create high end rhinestones. Today, 80% of all jewelry companies use Swarovski rhinestones. You can never go wrong giving rhinestones as a gift because they never go out of style. 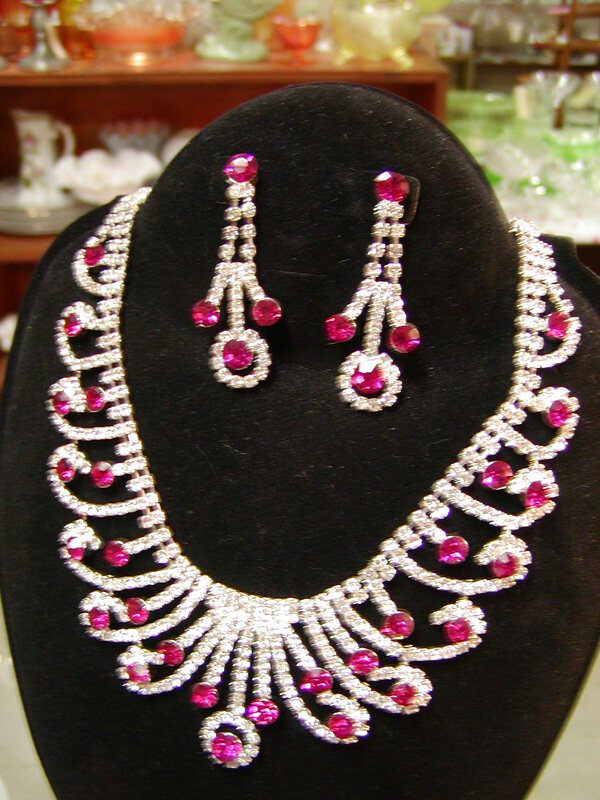 Rhinestones have been a centerpiece of costume jewelry since they were created in the 18th century. Whether you are looking for vintage or new rhinestone jewelry you can find it at the Albany Antique Mall. Prices range from about five dollars to hundreds of dollars. Can’t decide which gorgeous piece to get her? Gift certificates are also available. Ladies, remember that this Thursday, Feb. 2nd is “Ladies Night Out,” from 6:30pm to 9:00pm. Gather up the girls and come on over for lots of fun. As always, we will have lots of chocolate, prizes, great music and this year, BOOTH SALES! We hope to see you Thursday night! Albany Antique Mall, open daily at the corner of 2nd and Ellsworth in historic downtown Albany.